Everyone will applaud your culinary prowess when you serve these Beef Wellingtons with Peppercorn Sauce. These outstanding individual Beef Wellingons can be made a day ahead and cooked just before serving. What could be easier? This updated classic British dish is special enough for the most elegant dinner party. Traditionally, tender beef filet mignon is either coated with a pate or stuffed mushroom mixture and then wrapped in a puff pastry to bake. It was traditional in Britain to wrap meat in pastry before baking since oven temperatures used to be difficult to regulate. The pastry helped ensure even cooking and kept the meat moist. Beef Wellingtons can be prepared as a whole filet wrapped and baked and served as individual slices. You can also pre-slice the beef filets, wrap and bake as individual servings. In this recipe for Beef Wellington, I have pre-sliced the filet mignon into individual servings, coated with a fresh mushroom and herb mixture before wrapping with puff pasty. Check out all of Linda’s Beef Recipes using various cuts of beef and learn all about peppercorns. Bring steaks to room temperature. Coat steaks lightly with olive oil and season both sides with salt and pepper (press in with your hands). In a heavy frying pan (I use my cast-iron frying pan) over medium-high heat, heat 2 tablespoons olive oil. Sear the steaks, moving them with tongs a little so they do not stick to the bottom, for 2 minutes per side or until brown and crisp on the outside. 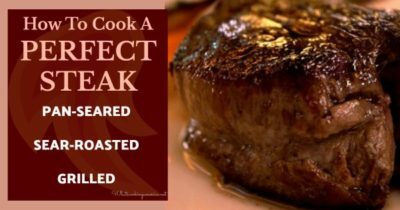 Steak will be partially cooked - do not overcook. Remove from heat and refrigerate steak, covered, until well chilled, about 1 hour. In a large frying pan over medium heat, melt butter. Add shallot or green onions and garlic; saute approximately 3 minutes or until slightly softened. Add mushrooms, thyme, parsley, and salt and pepper to taste. Cook, stirring, until mushrooms are lightly browned and their liquid is evaporated. Remove from heat and transfer mushroom mixture to a bowl to cool completely; set aside. On a lightly floured surface, roll out each puff pastry into two (14-inch) squares. Trim edges to form two (13-inch) squares and cut each square into four (6 1/2-inch) squares. Working with one square of puff pastry at a time (keeping other covered), spread 1/8th of mushroom mixture on the pastry, leaving a 1/2-inch edge on all sides. Place chilled steak in the center of the mushroom mixture; pressing it down gently. Wrap two opposite corners of puff pastry over the steak, overlapping them. Seal seam with egg wash. Wrap remaining two corners of pastry over steak and seal with egg wash. Wrap the pastry up over the steak and seal the edges. Place seam-side down on a non-stick baking sheet. Brush the tops with the egg wash. Repeat with remaining 7 steaks. Cover loosely and refrigerate at least 1 hour or up to 1 day. NOTE: Decorations for the Beef Wellingtons using the scraps from the puff pastry. Cut pastry into shapes with a cookie cutter or cut into leaf shapes with a knife and "glue" to the top of each Beef Wellington with some of the egg wash. Brush top of decoration with additional egg wash. While Beef Wellington are baking, prepare Peppercorn Sauce. To serve, spoon some of the Peppercorn Sauce on each individual plate. Place one Beef Wellington in the center. Drizzle a little more sauce over the top and garnish with a dill sprig. In a medium frying pan over medium heat, melt butter. Add shallot or green onions, green peppercorns and saute until onions are soft. Add brandy and cook until liquid is reduced by half. Add cream and simmer for 2 minutes. Season with salt, pepper, and dill.